The conflict between European Christians and Islam came to a climax near the end of the 11th century when Pope Urban II preached what we now call the First Crusade. However, behind the scenes was a swirling chaos of shadowy influences and personalities whose motivations and goals were not always easy to define. Most of the early crusaders were pious individuals who were motivated by the effort to free the Holy Land of infidels. But many in leadership roles had other ideas. And surprisingly, they were assisted by a fractious Muslim community whose divisiveness was thoroughly exploited by crafty Greek Byzantine diplomats and wiley Italian merchants. Richard A. Newhall, a medieval scholar, has produced a masterful outline of this confusing period of history by paring the subject to an understandable unity. By keeping the history simple and beginning with the first Muslim onslaught against Europe, he shows how the term "crusade" really has a much broader meaning. By tracing the conflict as it wound its way into modern history, Newhall demonstrates that the strife between Islam and the West has never really ceased. However, throughout the 12th and 13th centuries, the contact with the East had very profound effects on Europeans, including the rediscovery of lost classical authors like Aristotle, the introduction of new methods of mathematics and sciences, and a growing level of trade which eventually nourished the period we call the High Gothic. All of this spelled the beginning of the end for the Age of Faith, and it ushered in the Renaissance and the modern era. Discover how the dynamics of the crusades stimulated change in the Middle Ages and the consequences for three civilizations. The first thing I noticed about this book is that it certainly didn't cater to first time readers of this time period. If you do not have a good grasp of the major players and names of this historic period then I would recommend that you look elsewhere. The one thing that was slightly disappointing about this book was the brief mention of major events of this period. More specifically the minor less known crusades were only mentioned in a paragraph or two. Some of the major events were not given into detail and were only briefly mentioned. Because of this some of the background of why things were done is missing which leaves readers with a "fast foreword" view of the history behind the actions. I did overall enjoy the book however. It had an excellent commentary at the end about the good things that came about from the crusades. I would recommend this as a good book for people already slightly familiar with the major political players and events of this time period. Wow! I thought this book was great. Having said that I must say that it is not an easy listen. The names are strange, the places distant and the time was long, long ago when the world was a very different place from what it is today. I say this to describe why it is not an easy listen. I was constantly trying to place the people, the location or the historical occasion in context. This is not a negative criticism of the book but rather a criticism of my knowledge of the era. I found the book interesting, educational and well written. It is not a book for everyone but for those looking for an analysis of the crusades, I think this book is great. I've been studying the Crusades for over 50 years, and I can say without hesitation that this text is atrociously one-sided in the way that it glorifies the alleged accomplishments of Islam while completely omitting any detail about the widespread barbarity of Islam. Christians are largely portrayed as incompetent buffoons who ultimately benefitted from Islamic culture and scientific achievement. No mention is made of the millions of people enslaved and/or butchered by Muslim invaders, or how they mostly appropriated the scientific achievements of those they conquered and subjugated. If you're looking for an objective and comprehensive study of the Crusades, invest your money elsewhere. This text is revisionist trash. Kings, knights, battles, and desire ! 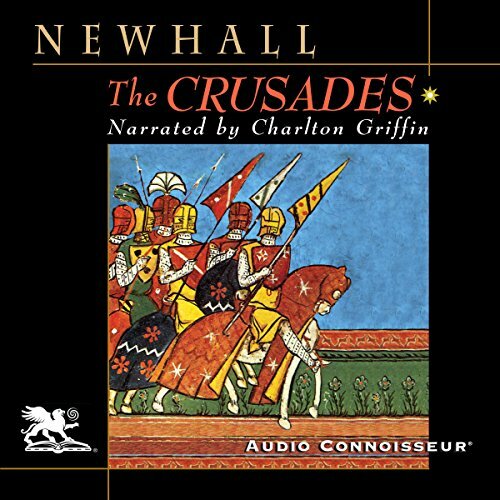 The Crusades by Richard A. Newhall is a grand listen filled with facts and stories to hold one in wonderment for very long periods of time. This was a time of uncertainty, a time of deals and back door deals where life was short and country was everything ! The scope and pace of this book is wonderful and if you close your eyes you may find yourself looking out though your helment as the horse you sit upon shakes and rocks with excitment, waiting for you to join the battle !!! Ccchhaaarrggeee !!!!! The narrator gets too carried away in speaking slow/fast and his accent makes listening very difficult. This, for me, is an example of how to make history boring and inaccessible to non-experts. It is just an array of facts - names, places, events - which assumes background knowledge that I am not even sure a world authority on the subject would have. I must admit to giving up after an hour or so. Maybe it was intended as at text book to blight the days of undergraduates? Would you try another book from Richard A. Newhall and/or Charlton Griffin? Griffin's voice sounded affected and condesending, and it seemed he was talking down to the listener. Wish I would have saved my money on this one. I don't know why, but I expected something different. It probably does present a more accurate presentation of events and the history that led up to the crusades, but it so boring and dry that I couldn't finish reading the book let alone remember what I had just listened to 10 minutes earlier. If you just want plain historical facts, then this is the book for you. If you are looking for entertainment, seek elsewhere. BORING! BORING! BORING...(YAWN, YAWN, SNORE..ZZZ)! Wow! This is the dullest telling of history I have come across in a long time. I'm sorry to say I could not finish listening to this book, which is sad because it's only 4 hours long; and while I really did try, I just couldn't take it anymore. I almost fell asleep at the wheel and I actually did fall asleep listening to it at home. Newhall is a boring writer and his book is neither remarkable nor entertaining. In fact it this book is nothing more than an accumulation of names, dates and events. It will probably take me less time to research this subject online and then read it too. Yes, I know this is a harsh review but I really mean it! In all honesty, I'm hoping to save the next person so he/she does not make the same mistake I made. Want to avoid falling asleep? Want to make a smarter choice? Then move along listener, because there is nothing worthwhile to purchase here.